"My guitar lesson with Ellen is my favorite hour of the week!" "Live Like You Were Dying" (Tim McGraw), "Heads Carolina"
Ellen Britton is a veteran musician with decades of performing, writing, recording, and teaching experience. The daughter of well-known Philadelphia area folksinger George Britton, Ellen grew up with a guitar in her hands, and as a teenager played the club and college circuit as half of blues/folk duo the Britton Sisters. A move to Nashville in 1991 led to staff songwriter gigs, frequent shows at the world-famous Bluebird Café, touring with Martina McBride, Pam Tillis, Jo Dee Messina, Sara Evans, Lari White, Maura O’Connell, Tanya Tucker, and appearances on The Tonight Show with Jay Leno, Late Night with Conan O’Brien, The View, The Rosie O’Donnell Show, and The Today Show. 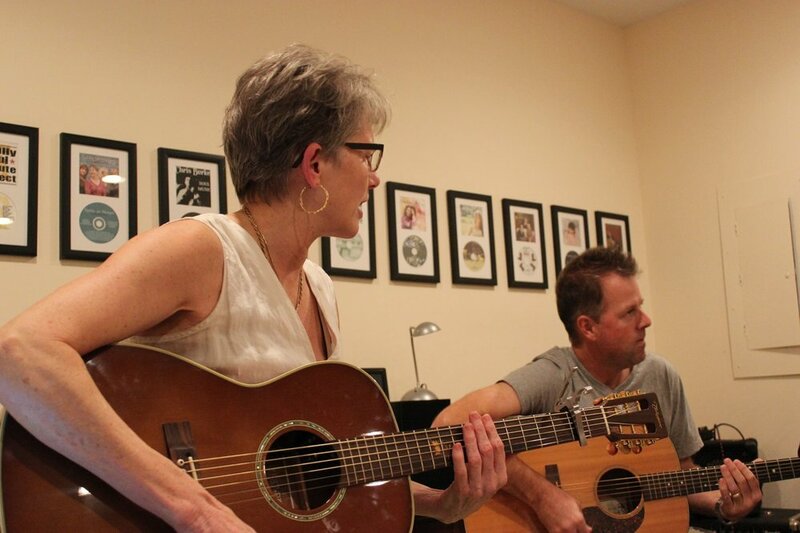 Receive tips for guitar players, updates on group classes, and general musings from Ellen!